A belief in free will touches nearly everything that human beings value. It is difficult to think about law, politics, religion, public policy, intimate relationships, morality—as well as feelings of remorse or personal achievement—without first imagining that every person is the true source of his or her thoughts and actions. And yet the facts tell us that free will is an illusion. LIFE/ WORLD Altering sophisticated thinking! 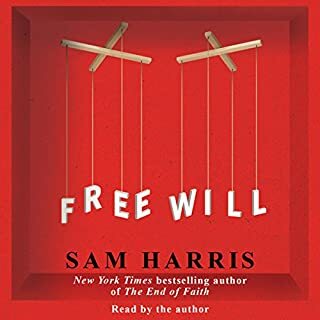 Where does Free Will rank among all the audiobooks you’ve listened to so far? This is one of the top 3 audiobooks I have listened to so far (and I have LOTS of audiobooks). I will listent to it many times----and hopefully some guests in my car will also have the privilege to be titillated by his thoughts. Sam Harris is amazing! I love the subjects he choses to grapple with. I love the conclusions he draws. I love the potential impact on the way the world perceives punishment/guilt/free will. I love the fact that Sam is a neuroscientist --- clearly his opinions are based on lots of scientific knowledge--not just a philosophy. What does Sam Harris bring to the story that you wouldn’t experience if you just read the book? I am a big fan of audiobooks. I have ADHD and the audiobook enables me to "read" books I would not otherwise be able to sit still and really comprehend fully. I have become accustomed to listening to audiobooks in my car and when the author reads the book to me--it is magical---of course he wrote it--so only he can put the passion in his words---it makes a HUGE difference---I do have other audiobooks read by someone else other then the author---it's such a privilege to hear him speak his ideas---not to mention he has a very calm clear voice. Maybe like one of those plateaus in evolution that really jumps a species to the next level---is it possible to jump to another level in evolution just by having a thought? I think maybe so!